The death of former New York State Governor Mario Cuomo touched me in a personal way. Cuomo was the A-list commencement speaker at my graduation from Syracuse University back in the 1980s. It was at the peak of his popularity, a time when Cuomo was being urged by all the Democrats to run for the White House and be the last, best hope of saving the nation from darkest Reaganism. At the time all I could think was, "MY university nabbed this VIP as our class graduation speaker? I must really be going places! My job successs in the outside world is guaranteed!" Well, it wasn't. I did enjoy my graduation ceremony very much - I actually photographed it for the college yearbook, a felicitous way of stepping outside the box, so to speak, and be part of the event and yet take a grander role in it. Little did I know that would be a very rare example of career advancement for Charles Cassady. Much of the next several decades were professionally and personally stagnant and frustrating and soured by perpetual human-resources rejection. And now, my disposition on the matter forever tainted, I do not particularly recommend attending college for anyone. "College is pretty much an interesting waste of money and time, a trap to keep you in lifelong servitude to your student loans, and a sneaky, quite unethical method of keeping the institution's professors and faculty very well paid for leaving you with nothing of tangible value, in an 21st-century minimum-wage service economy with few opportunities and fewer options. Especially in Cleveland." I do not honestly recall what Mario Cuomo actually SAID at my graduation, but I don't think he said anything like that. I might have remembered it if he had. Were I ever to become a popular graduation speaker (I guess there's an opening at Temple University now, with Bill Cosby's issues), I like to think I might tell the matriculating seniors the cold, hard truth that in the Globalized States of America there's nothing out there waiting for you. Nothing. Except maybe a paper trainee hat at Burger World (if you are lucky). Sorry about those four years or more of study you put in here at this miserable school in hopes of enhancing your value in the eyes of any potential employer or allocators of positions and privilege. That sort of thing really just doesn't happen any more. Maybe in India or China, at the most. But hey, at least you enjoyed some wild times there on campus. Surely you made a scrapbook out of it or something? My advice, really, for young people in these diminished days: just live near or intrude upon a college campus, in which you could never realistically afford to enroll. Read the student paper, watch the website and peruse the bulletin boards. Go and take part in as many fun and stimulating activities as you can, even if you're only a lowly "townie" with a high-school diploma. You'll be saving your money while still skimming off the best that college in Recession USA has to offer, the recreational diversions created to prevent the REAL students from thinking too much about how they have No Future. A good example: The Case Western-Reserve University Science-Fiction Marathon, a customary kickoff to the winter-spring series of the CWRU Film Society, right here in Cleveland's own Student Loan Poverty Circle (oh, do they still call it University Circle? I thought there had been a more fitting name change with all the new construction). The Marathon has been a CWRU tradition for an amazing 40 years (that's longer than my job search! Thanks Syracuse). 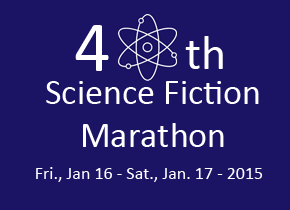 Spawned by the campus student-film society - but with attendance open to anyone who can take it - the CWRU Sci-Fi Marathon has a national reputation as an endurance test for fans of SF and fantasy. It all starts on Friday night at 8 p.m. in Strosacker, off University Circle. Ticket-bracelets go on sale at 6 p.m. for $30, and if you keep yours on you can enter and leave throughout the marathon, right up to when it ends early Sunday morning. Otherwise, if you just want a taste of what it feels like to be among punch-drunk sci-fi fans, student-loan-crippled-for-life college kids and Trekkies in full uniform, the charge to attend an individual feature is $4. A number of people do indeed last through the entire marathon, and a handful repeat the torture-endurance test year after year. Sometimes it helps to revive in the lobby with xBox and Playstation videogame tournaments that are set up projected onto a handy wall. Sleeping bags are permitted, as are snack foods and personal computers. No glass bottles, no alcohol, no campfires. Because of the mix of family and R-rated material, any viewers under 18 must be accompanied by a parent or guardian. GODZILLA (2014) Friday at 8:30 p.m. Surprise movie #1, Friday at at 11 p.m. THE INCREDIBLE SHRINKING MAN Saturday at 1:15 a.m.
SLEEPER Saturday at 3 a.m.
STEAMBOY Saturday at 4:45 a.m.
HONEY I SHRUNK THE KIDS Saturday at 7:15 a.m. FORBIDDEN PLANET Saturday at 9 a.m. Surprise movie #2, Saturday at at 11 a.m.
JODOROWSKY'S DUNE Saturday at 12:30 p.m. ATTACK OF THE 50-FOOT WOMAN Saturday at 2:45 p.m. Surprise movie #3, Saturday at at 6:30 p.m.
JUMANJI Saturday at 8 p.m.
TREMORS Saturday at 10 p.m.
For full rules, regulations, directions to free parking, photos of past Marathons and other and inside tips, log onto the website of the CWRU Film Society, at http://films.cwru.edu/sfmarathon40/index.php/.